The Nazis discovered it. The Allies won the war with it. It conquered diseases, changed laws, and single-handedly launched the era of antibiotics. This incredible discovery was sulfa, the first antibiotic medication. 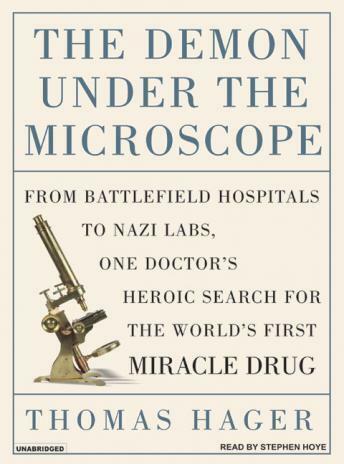 In The Demon Under the Microscope Thomas Hager chronicles the dramatic history of the drug that shaped modern medicine. Sulfa saved millions of lives-among them Winston Churchill and Franklin Delano Roosevelt, Jr.-but its real effects are even more far reaching. Sulfa changed the way new drugs were developed, approved and sold; transformed the way doctors treated patients; and ushered in the era of modern medicine. The very concept that chemicals created in a lab could cure disease revolutionized medicine, taking it from the treatment of symptoms and discomfort to the eradication of the root cause of illness. A strange and vibrant story, The Demon Under the Microscope illuminates the colorful characters, corporate strategy, individual idealism, careful planning, lucky breaks, cynicism, heroism, greed, hard work, and the central, though mistaken, idea that brought sulfa to the world. This is a fascinating scientific tale with all the excitement and intrigue of a great suspense novel. This is a great book packed full of information. I learned bits and pieces of this story in school but this book gives an in-depth view of the entire field from the discovery of bacteria to the discovery of antibiotics. It cover the discovery of sulfa mainly but the warnings on improper use that lead to resistance should continue to be a dire warning today. This was very well written, informative and intriguing. It answers questions I've had for 40+ years. I would recommend this book for everyone in the medical and medical research field, and anyone intrigued at how politics controls science and the practice medicine. I loved the book, but hated how it was read. The reader had a breathless, sing-song style that was extremely distracting. I've audioed about 120 books here and never been so annoyed by a reader. That being said, the book itself is wonderful...I'd give the non-audio form of the book five stars. It details the discovery of the first real antibiotic, sulfa, and the people around its discovery. Well written and, believe it or not about a book on chemicals, exciting! This book kept me interested CD1 to CD10. It's a great discussion of how the development of sulfa drugs changed history during wartime and after. Lots of interesting facts interlaced with commentary. Not your typical history book - try it.